Along Croatias Adriatic coast you will find the freshest and tastiest of ingredients, menus designed according to the season and recipes that have been passed down through generations. Traditional family restaurants serve up exquisite fresh meat and fish on the islands, while in the larger cities and coastal hotels fine dining has arrived, with some restaurants creating an intriguing fusion of tradition and modernity. There is an increasing choice for vegetarians, but Croatia is a nation of meat-lovers; on the coast however fish and seafood is abundant. 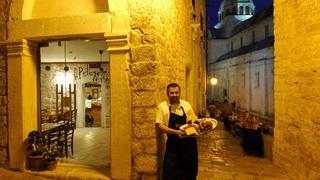 Cooking styles vary from region to region, with seafood cooked with sauces and pasta in Italian-influenced Istria, and served straight from the grill in Dalmatia. The adventurous will not be disappointed by local wines and liquors but other European wines may be harder to find. There is a huge variety of homemade and more prestigious Croatian wine, and many restaurants are beginning to highlight local vintages. 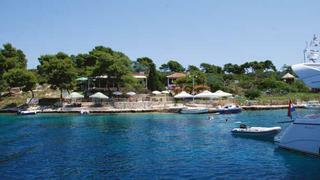 Croatias spectacular coastline of bays and islands is best explored by boat, and many of the restaurants featured have moorings or anchorages directly adjacent. As you enjoy the crystal clear waters of the Adriatic, these are the places to sample their bounty. 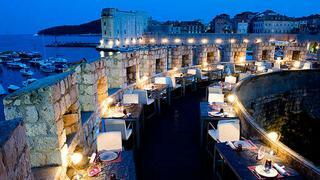 Patronised by celebrities, royals, the international political élite and even a Pope, Restaurant Nautika is recognised as the place to be seen  and eat  in the ancient city of Dubrovnik. 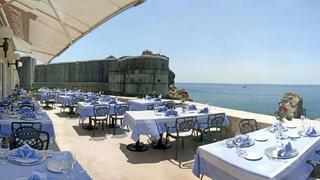 Located on the seafront next to the Pile gate, the restaurant has stunning views of the Adriatic and the old fortresses of Lovrijenac and Bokar. Like many Croatian institutions, this was once something else  in the 19th century the building housed the Dubrovnik School of Maritime Studies. The restaurant blends this history lightly with bare stone terraces and light wood furniture to create a timeless Croatian atmosphere. The combination of its historic setting, cosy seating and stunning views  especially in the evening  has given Nautika the reputation of being one of the worlds most romantic restaurants. 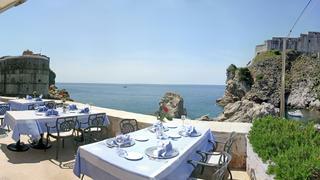 Aside from its unique location, guests are primarily attracted by the food, which is made from the best and freshest of ingredients from the Adriatic. Specialities include lobster from Vis and cuttlefish risotto made with squids ink. As the highest rated restaurant in Croatia in the influential Gault Millau, Gils has a lot to live up to. 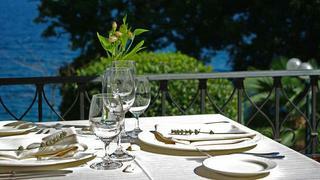 Known to gourmets and socialites alike, the buzzing, modern style restaurant attracts visitors from all over the world. Located at the very heart of Dubrovniks famous old town that curves into the sea, Gils views are spectacular  there is good reason for the citys nickname of the pearl of the Adriatic. From tables set between the castellation of a tower that once formed part the citys fortifications, you get a view over the old town and the marina. Alternatively, the cosy, stylish interior also has views out to sea. Like anywhere along this coast, Gils boasts spectacular seafood. The cuisine reaches beyond standard local fare however, describing itself as modern French-fusion. Parties are encouraged to order as an entire table if they want to enjoy Gils signature set menus, luxuriously ranging from either four or six courses. In sight of the marina, Gils is ideally located for visiting superyachts, but as it is popular with local and international celebrities it is advisable to book early. Villa Astra is just 30 metres from the sea, or a 20 minute walk down the lungomare cobblestone seaside walkway from the Icici marina. Its seaside location and private atmosphere originally attracted Italian Nicolo Guerra, who built the neo-Gothic mansion for himself. The villa was later bought by Vjeko Martinko, an international corporate businessman who was seeking a change of pace in his life. He transformed it into a hotel and restaurant, which is run on a sustainable, health conscious basis. The Bay of Kvarner in which it is located has been famous since the 19th century for its restorative properties, and Martinko sought to harness these natural calming properties with an ayurveda program at the hotel. This health and wellbeing ethos transmits to the cuisine in a way that is calculated to entice gourmets. Based on a menu of locally sourced ingredients, Villa Astra was the first restaurant in Croatia to be certified as fully organic. Local specialities such as seasonal wild asparagus and local cherries and chestnuts give flavour to a surprisingly modern menu. Echoing the Villas heyday, diners sit in beautifully reconstructed dining rooms in the Croatian, Hungarian or Austrian style. The historic detailing is set against modern portraits of Emperor Franz-Joseph, giving the rooms a light and contemporary feel. Antonios restaurant and bar, on the picturesque, lavender-scented island of Marinkovac near Hvar, is a welcome haven of good food on the coast. From deckchairs scattered on terraces in front of the restaurant guests gaze out across the beautiful waters of Zdrilca Bay, enjoying a pre-dinner glass of wine, while meals are served on the large terrace, surrounded by pine trees and fragrant rosemary bushes. The fare is plucked fresh from the sea  seafood dishes like octopus salad and marinated anchovies are featured along with black mussels, sea bass and red scorpion. Everything is overseen by the affable owner Ante, well known by his nickname Donald Duck, who rules the kitchen. His wife Nada and two daughters make up the staff. House specialities include white fish gregada  fish cooked over an open fire with potatoes and spices  or spiny lobster with a spicy tomato sauce called brudet; guests can select a lobster from a pot on the adjoining pier. Nada keeps a watchful eye on guests to ensure they finish every morsel of her homemade regional desserts, such as kremsnita, a vanilla cream cake, and crepes served with hot cherries and ice cream. Antonios treats guests like extended family, making it an excellent choice for informal dining with good food and good cheer. ibenik cathedral is a stunning mix of architectural styles, and is on the UNESCO World Heritage list, but for yachts mooring opposite this gem, the next treat is discovering the restaurant next to it. Open all year round, Pelegrini is working to dispel the notion that Croatias coast is dead out of tourist season, and after its year-long renovation in 2007, Pelegrini is fast becoming known as one of the best restaurants in Dalmatia. Owner and chef Rudi tefan is passionate about food and wine, and can often be seen scouring local markets for fresh local ingredients to include in his daily menus. The blend of traditional ingredients and modern cookery attracts culinary enthusiasts from around the world who come to take Rudis master class, and diners are sure to see him at some stage of the night, either behind the counter or popping out of the kitchen to survey his achievements in the restaurant. Special attention is placed on the wines  in fact, the restaurants full name is Pelegini Tavern and Wine Cellar and it is housed in a building once used to store the famous local Maratina, a sweet white wine that was traded Europe-wide. Rudi indulges his passion for fine wine with an extensive wine list, divided by country, from the local Maratina itself to French Beaujolais as soon as it arrives from the chateau. Eat unusual specialities such as truffle and prosciutto papparelle with sheep milk cheese and fresh parsley pasta, or a sausage of tuna meat. Located up the the Krka River estuary past ibernik, Skradin is a charming small town with a marina and moorings on the town quay. Zlatne koljke is one of the highlights of the town, having been a fixture for almost 30 years. The family-run restaurant is owned and managed by Ante and Marija Petrovic, with chef Ivan Lovric providing locally sourced meals with a difference. Zlatne Skolje prides itself on its gourmet seafood dishes but, unusually for restaurants on the Dalmatian coast, they also have a range of meat dishes. Guests come from all over Europe, primarily from the UK, Germany and Italy (Croatias main visitors), and the food reflects both local tradition and international influences. Inventive specialities include the house cold starter, minced octopus patties, the local Skradin risotto and even snails. They serve a wide range of shellfish, including Noahs Arks, which are local to the Adriatic. 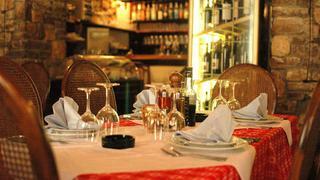 An extensive wine list to go with the food is another of Zlatne Skoljes specialities. Sommelier Marija Petrovic has collected a huge range of Croatian wines, alongside a respectable selection of French, Italian and new world vintages.